A while back, I wrote a some columns for Serious Eats called Knead the Book where I reviewed bread-baking books and made some of the recipes. 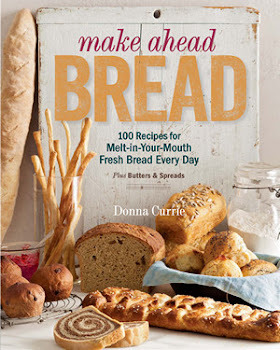 The Art of Baking Bread is the bread book I wish I had when I first started baking bread. Back then, most of the bread books were filled with recipes, which makes sense. But they assumed the reader would know how to knead or fold or shape. And that makes sense, too. You wouldn’t expect a cookbook to explain how to stir soup or give detailed instructions on how to peel a carrot. Handling bread dough isn’t difficult, but it takes some practice and you need to know some basics before you begin. This book teaches those basics. Oh, sure, it has some recipes. But not a lot of them. Most of the book is about technique, and it goes into detail, dividing the process into eight steps. That makes the few recipes a little difficult to follow because each step refers to instructions in another section of the book. But that’s only the first time you make a loaf. Once you’ve mastered the techniques, you won’t need to refer back to the details. But it’s not just about basics. It’s also about options. Many techniques offer different methods. You can knead your bread using the standard method or the French method. There are several methods for folding dough. And the list goes on. Along with the instructions, there are tips in each section, as well as comprehensive information about equipment and ingredients. It’s all written in plain language so it’s appropriate for a beginner. But at the same time, there’s plenty for the more experienced baker to think about as well. There are two methods of bread kneading described in The Art of Baking Bread . This is the conventional method. From The Art of Baking Bread by Matt Pellegrini. All rights reserved. 1. On an unfloured work surface, place the ball of dough directly in front of you with the heel of your hand on top of the dough. 2. With the heel of your hand, push the dough downward (toward the work surface) and forward with a smooth stroke. Make sure that your are pushing hare enough that the dough moves underneath your hand, but not so hard that the dough beings to tear. When you have pushed the dough so that the heal of your hand is at the front edge of the dough, remove your hand from the dough. 3. With your other hand, fold the dough in half and move the dough back to where it started before the first knead. 4. Repeat steps 1 through 4 until the dough becomes smooth and the gluten has been developed to the desired degree. Work the dough as close to your body as possible to alleviate unnecessary pressure on your back. Focus on pushing the dough, not rolling it or compressing it. Resist the urge to add flour to the dough. The more you knead, the more air will be incorporated into the dough and the more the flour will absorb the water. Both will help to combat what appears to be excessive moisture. If the dough sticks to your work surface, use the stiff bowl scraper (or bench knife if it won’t scratch your surface by doing so) to scrape the bits of dough from the surface and return them to the rest of the dough. If you find that you are getting tired during the process, switch hands. It might take a little getting used to as far as coordination goes, but once you get the hang if it, you’ll be able to work through the kneading process that much easier. As you knead the dough, you will notice that it transforms into something much smoother and more elastic. This means that the dough is developing precisely the way you want it to. So keep doing what you’re doing. If you use the conventional method to knead dough with a greater hydration level, it is helpful to use the bowl scraper instead of your hand to gather the dough and fold it upon itself during the kneading process. If you use your hands, the dough sometimes sticks to them so much that it’s hard to keep the dough together. If you decide to make larger batches of dough, be aware that the heavier weight of the dough takes more effort on your part. Keep that in mind so you don’t wear yourself out before the dough makes it to the oven! Want to win an AUTOGRAPHED copy of this amazing book? Sorry! Tbe giveaway is now OVER. PLUS four other cooking-related books?